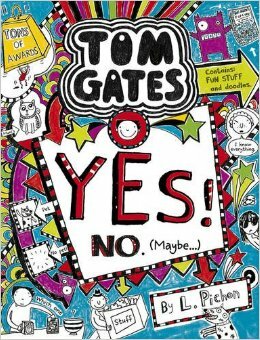 ‘Yes No Mabey’ is about a boy’s life where he has ups and downs. He has a mum, a dad, a sister, a grandma and a grandpa which are called the ‘Fossils’. His sister always annoys him. His mum likes to do outdoor stuff like car boot sales and his dad is clumsy and always tries to get help from his son. Mr Fossel always does not do what he’s told and is very nice. Mrs Fossel tries to tell Mr Fossil what to do all the time. When they went to a carboot sale no one wanted to go except his mum. They rounded up stuff they didn’t need and their car breaks down on the way. The dad and the son sell an expensive cat brooch and try to get it back. It is all drama. Amy is his best friend that he sits next to in class. Marcos always annoys him and sits next to him in class. My favourite character are the dad, the son and Mr Fossel because they have a great part in the book and are funny. I think this book is very funny and some bits are really serious. Loads of things happen so you want to find out everything and it doesn’t get boring.